Forget jetting over the Tasman if you’re planning a houseboat holiday … it’s taken a healthy dose of imagination, tempered with a good deal of patience, tenacity and pure passion, but Ian and Judy Simpson are now able to boast that they are the operators of the Waikato’s very first Boatel (floating boutique hotel). Whilst the vast majority of us know the mighty Waikato purely as a source of power, and local farmers see it as a source of water, duck shooters, canoeists and other water sport enthusiasts will attest to the sheer beauty of this magnificent stretch of water. Having sailed on some of the most beautiful coastlines and waters around the world, I must admit to initially voicing a little skepticism – could this really stack up? Well, nothing ventured, nothing gained … the date was set and I was about to find out. On a blustery Saturday morning, with weather predictions forecasting some very nasty weather including gale and flood warnings, we set out for Tuakau, just south of Auckland. The drive itself was scenic, along windy country roads and, even in the bad weather, was very soon at an end. We were met by our hosts who welcomed us into the Discovery terminal overlooking the river. Our cars were parked up in secure parking, our luggage was swiftly transported to the vessel and it wasn’t long at all before we were ensconced in the cozily heated environment of Manuwai Tuarua, the Maori name for Discovery 1. 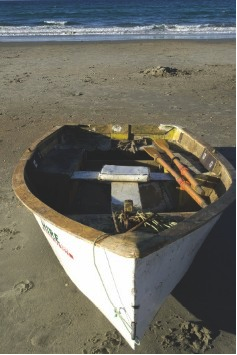 As with all boats, generally it’s shoes off as you board. Fear not, though – no cold feet here – we were each given a pair of house slippers before our skipper, Warwick, gave us a guided tour of the boat, pointing out the lengthy list of creature comforts … we’ll get to most of them as we work our way through the story … and running through the necessary safety drills that are incumbent on all maritime skippers. A welcoming bottle of champagne awaited the adults, and the kids were even made to feel special too with a glass of orange juice served in champagne flutes. A beautiful touch and a great start to a journey of pampering, was that we were told we could take our engraved flutes home with us as a keepsake of our voyage. On all my cruises onboard some of the most expensive charter vessels in the world, I’ve never come across such a fabulous gesture – I was impressed! As we left our moorings, the kids settled down in their cabins. While one read a book and listened to music, another got stuck into a DVD, while the younger two amused themselves with Cartoon Network. And no – there was no squabbling, as each cabin is fitted with a flatscreen television with built-in DVD player. This in turn has access to the Sky network and in-house music. As we idled along the meandering Waikato Riverlands, we spotted mai mais dotted here and there, now empty of humans with duck season over for another year. A few weeks ago, the waterways would have been dotted with decoys – today there was only the odd flutter of a wing as a lone duck or hungry hawk made their way across the darkening sky. I couldn’t help thinking that a few nights onboard Discovery 1 would be far preferable to the mai mai – a duck shooting hotel on water. Imagine … hot showers each the bone chilling cold that can be a duck hunter’s nightmare, an extremely comfortable bed to rest a weary head, and let’s not forget a great meal to end a long day’s hunting – especially if the hunting wasn’t too successful! We found a spot to moor for the night, anchors were dropped and our skipper left us to our own devices, promising to return at 6.45pm with our dinner. That’s right – we didn’t even have to cook! We had been telephoned a few days before our trip by Stuart of Café Kaos who cater to the vessel. The more I learned of their operation, the more intrigued I became … for starters, they don’t have a menu, preferring instead to work with each party to ensure their every whim is catered for. After running through my family’s meal preferences, and the fact that we didn’t want a waited-service on this occasion, we settled on a hearty winter soup to start, lasagna and salad, followed by apple crumble. Fairly basic, I figured, and something I could reheat myself if we weren’t quite ready to eat. What arrived far surpassed any expectations any of us had. While hubby and I are soup fanatics, the kids can usually take or leave it. The leak and potato soup, accompanied by the most incredible loaf of bread, was devoured, with all of the kids asking for second helpings! The freshly made lasagna, accompanied by a mesculin salad tossed with garlic infused vinaigrette, didn’t stand a chance … it too was devoured. I did wonder, the way the kids were eating, who would be up for dessert … I need not have worried … they all were, none being able to deny the beckoning aromas of apple and cinnamon that were sneaking out of the oven. After such a splendid repast it was delightful to be able to stack the dishdrawers and not have to worry with washing up. It’s worth pointing out that the kitchen (it really wouldn’t do to call this a galley!) is extremely well fitted … free standing domestic fridge/freezer with chilled water dispenser and icemaker, electric oven, gas hob, microwave, double dishdrawer. There’s sufficient high quality glassware, dinnerware and cutlery to feed a veritable army, pots and pans in all shapes and sizes, and a myriad serving dishes. Tea, coffee, sugar and milk are provided, as is a range of locally produced olive oils, salt and pepper grinders and a well-stocked first aid kit. If? you don’t intend to take advantage of the service provided by Café Kaos, you’ll need to bring all other groceries and drinks with you. After dinner, the kids ventured onto the massive top deck where the boys lounged in the 10-man spa pool while the girls lit up the evening with some dancing and gymnastics accompanied by the strains of their favourite pop bands. This area boasts a wet bar, small fridge and massive stainless steel barbecue. There is space galore – it would be the ideal spot to host a product launch, I reckon, and would suit intimate weddings, too. The adults adjourned to the lounge area, coffee and port on hand, and settled in to watch the Da Vinci Code on the large plasma television. As the kids showered in their ensuite cabins and readied for bed, my thoughts as a parent were along the lines of “How blissful – no tiffs over who’s in the shower, who’s taking too long in front of the mirror and no ‘get out of my room’ shouts of sibling rivalry. With four cabins (three vast doubles and a twin), there was room for all. The two rear lounge areas, complete with luxurious sofa beds, can also be walled off to create two further sleeping areas, and there is a separate day head to cater for them. It’s fair to say that no-one goes without onboard Discovery 1. As the morning light broke through the clouds, the kids gathered around the massive dining table for Weet-bix or toast and we faced the prospect that we didn’t have much longer to enjoy the solitude and splendour that we were fast becoming used to. The size of the dining table had me picturing secretive board meetings, small team building conferences for sales staff or similar. I personally couldn’t think of a better way to motivate staff … work like crazy indoors for a few hours while the chef prepared a sumptuous lunch or dinner on the barbie upstairs. A quick spa to refresh the mind and soul, then a few more hours of intensive work indoors before dinner. Unfortunately, we didn’t have the weather during our visit to make use of the two kayaks kindly provided by Kiwi Eco Adventures, we never managed to venture onshore and try out the quad biking that’s so popular in the area, and the fish may have been biting but I wasn’t keen to toss a line this time around. So I may just have to pay a return visit when the weather is a little kinder or during the summer months. Next time around, I’ll no doubt book a round of golf in for hubby, too considering there are a few courses in the area. Mind you, knowing the state of my golf game, it might pay for us to check into the nearby Kaye Maxwell Golf Retreat, tagging a night or two on there! In fact, I may need a couple of weeks to discover just how much the Franklin area has to offer … there are still the wineries to investigate, whitebait recipes to try out, the Nikau limestone caves to explore and a spa or too to indulge in. 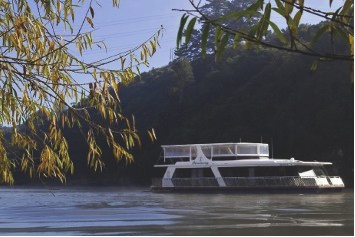 One thing you can be assured of is that my journey along the mighty Waikato Riverlands has only just begun and I hope you will climb onboard as I disembark, and find your own voyage of discovery onboard Discovery 1. Congratulations to Ian and Judy for coming up with something so special, so unique and so very involved with everything that makes the Franklin area such a delight to discover. Tourism in Franklin – www.franklincountry.com?